One aim was to make strenuous work at tire service provider Pneuhage easier and to reduce back pain. The other aim was to set an example with the LumboTrain – for prevention, for motivation, and for employees. In the modern, digital world of work, many processes can be accomplished more easily and more effectively. 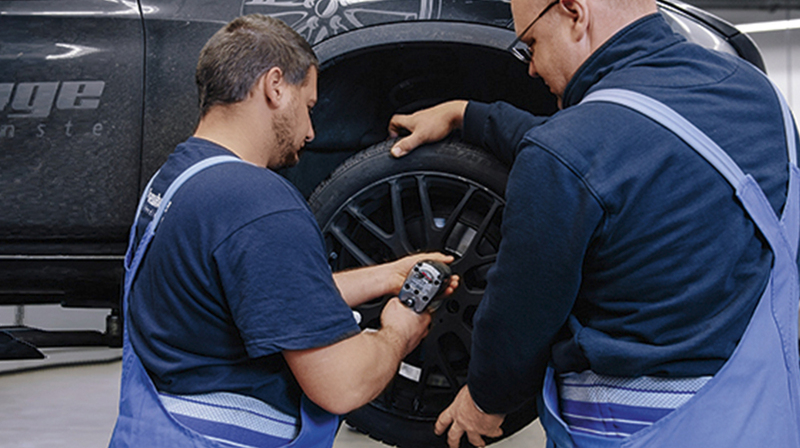 But employees in the industrial sector still carry out backbreaking work, handling heavy loads on a daily basis – and workers at tire service provider Pneuhage are no exception here. The workers lift , store, roll , and fit the high-tech product – a product on which our safety on the roads depends. Large tires for trucks and tractors are particularly heavy. Alexander Wolff’s respect for the object of his work is evident in his voice. He is a technical coach and occupational safety expert at Pneuhage tire services, which operates around 90 branches in Germany. It was particularly in his occupational safety role that he was involved in an observational study with the LumboTrain back support , which was conducted at Pneuhage over a period of six weeks “during the high season for tire changes, between August and October”. The study was a success. Use of the muscle-activating support by 32 employees, most of them tire fitters, led to a drop in the number of “days of pain” experienced by workers with back pain from 3.9 to 2.5 days per week. At the start of the study there were four workers who reported “severe pain”, but after wearing the support for six weeks, this number had dropped to zero. And while just one worker was completely pain-free at the start of the study, this figure had risen to six employees by the end. The conclusion was that wearing the LumboTrain active support resulted in a reduction in both the intensity and frequency of the back pain experienced by the participants. The employees who took part in the study, with an average age of 40, felt that their performance at work was better. The study participants also rated the massage effect of the pad very highly. And, last but not least , they also appreciated the company’s thoughtfulness in providing them with the LumboTrain. “That obviously motivates people,” says Alexander Wolff – and it’s reported that the executive management of the Pneuhage Group, which has around 2,000 employees, is planning to supply more workers with the LumboTrain in future.